Poorly-fertilized hot pepper. Tomatoes (background) are well-fertilized. 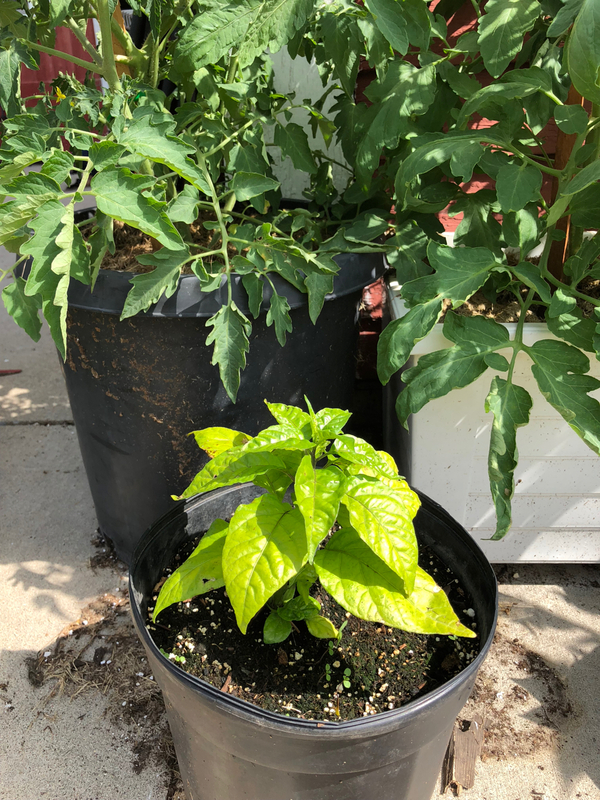 Nutrients in containers decline quickly as a result of rapid plant growth and frequent watering, which can leach nutrients from the potting media. Liquidor soluble fertilizers, for example, are easy to apply during routine watering and may be applied every week or two at full strength or more frequently if diluted. Inorganic soluble fertilizers are best for rapid delivery of nutrients to plant roots. If using organic fertilizers such as fish emulsion or kelp extract, be aware that nutrients may not be available quickly enough for fast growing plants, although organic fertilizers are often a great source of micronutrients such as iron or manganese. Controlled-release fertilizers are an excellent option for container plants. They can minimize nutrient losses through leaching and provide plant nutrients for several weeks to months: duration depends on plant growth, watering frequency, and temperature (warmer temperatures can release nutrients more quickly). Regardless of which fertilizer you choose, always follow label instructions for application! Over-fertilizing is detrimental not only to your plants, but also to your wallet and to the environment.